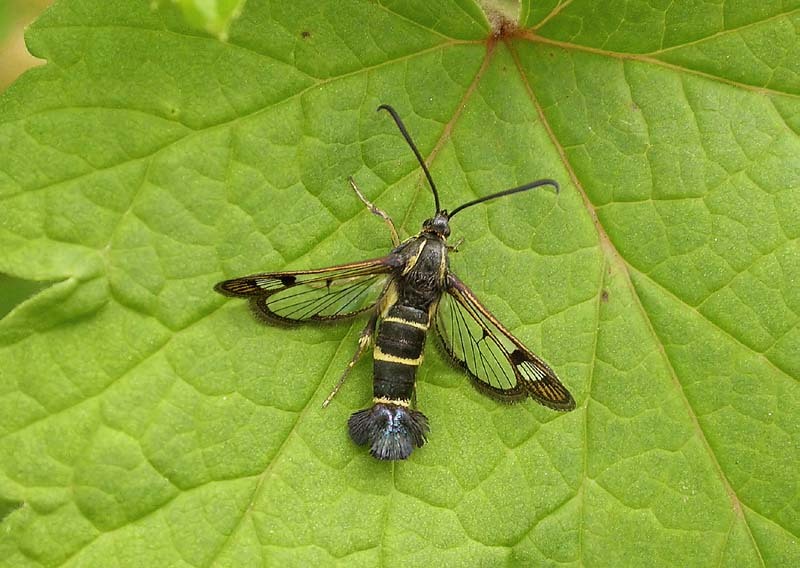 52.013 Currant Clearwing feeding hole, Skircoat Green allotments, Feb.19th 2014. 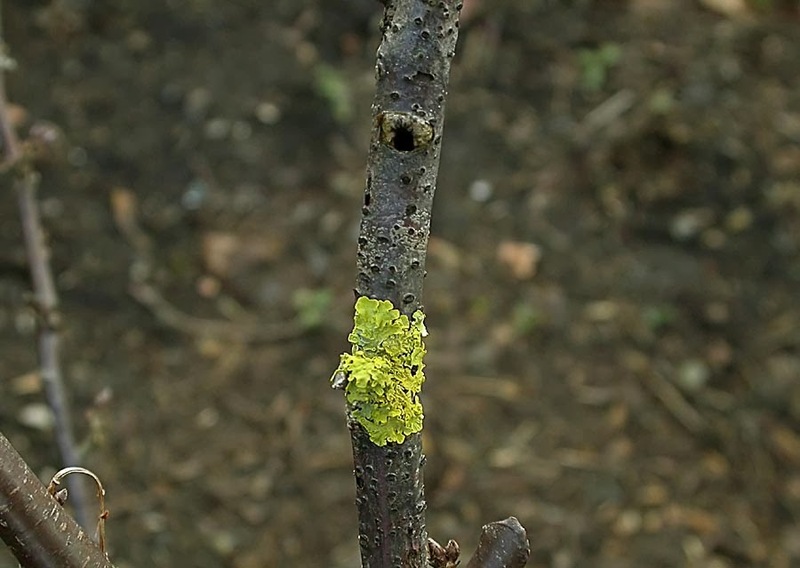 Whilst pottering about on the plot I noticed a rather obvious hole in this twig of my Red Currant bush. I took a good few inches of it either side of the hole and split it in half. Below you can see the results! 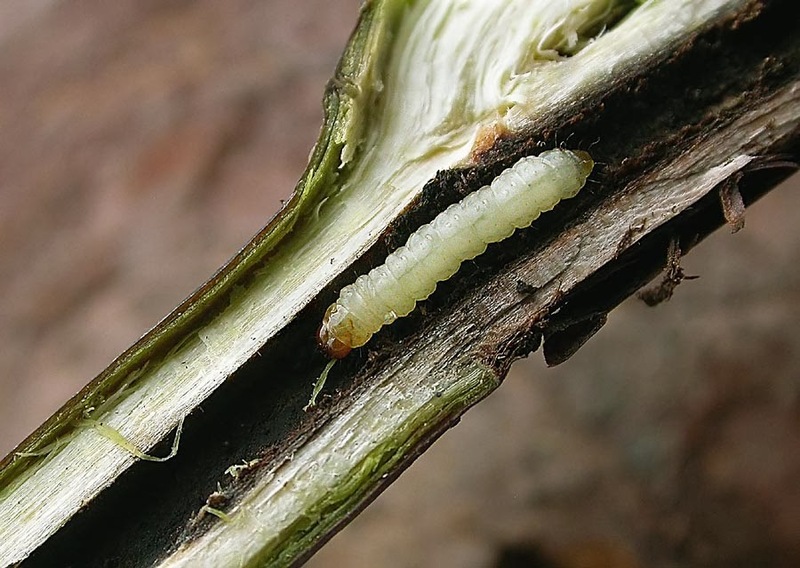 52.013 Currant Clearwing larva, Skircoat Green allotments, Feb.19th 2014. 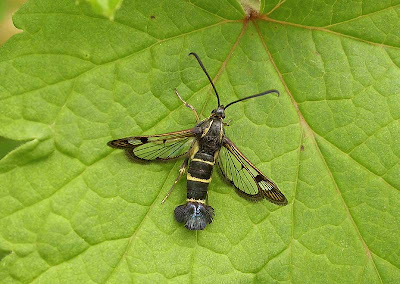 52.013 Currant Clearwing. 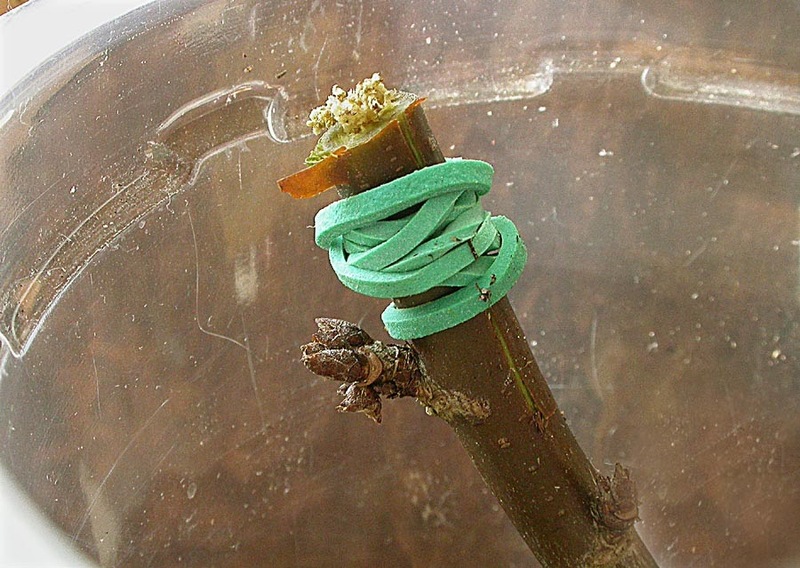 Carrying on from above, the larva eagerly switched to a fresh piece of Red Currant stem which I had split and hollowed out the top 20mm or so to give it a safe place in which to feed, and lo and behold the next morning there was plenty of ejected frass on the top of the stem and on the potting compost below in which the stem will hopefully take root. 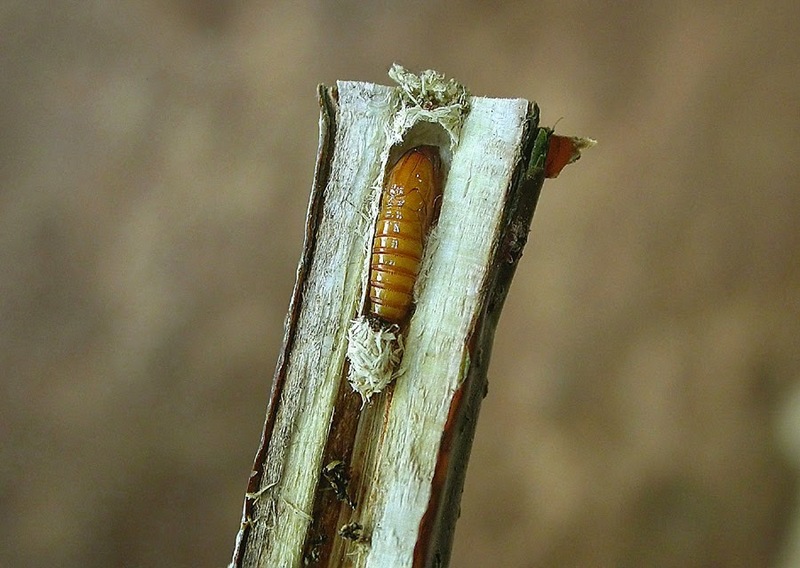 52.013 Currant Clearwing pupa, Mar.21st 2014. After transferring the larva to another new stem I was surprised to see it had soon spun debris together to seal the open hole at the top which it used to use to eject frass from. Little did I know that it was preparing to pupate by spinning a silken chamber and plugging it at each end using chewed up pith. It did this well over a week ago so emergence may be in just a couple of weeks ???? I have carefully replaced the other half of the stem. 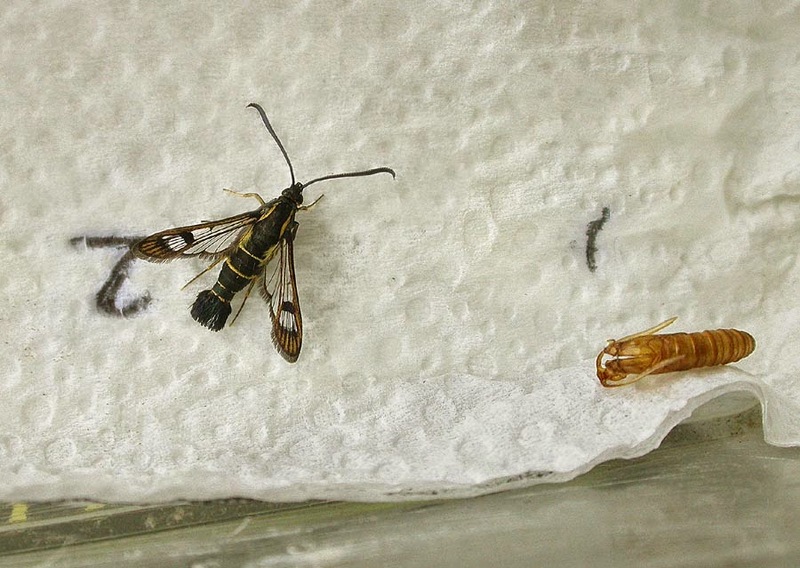 52.013 Currant Clearwing adult and empty pupal case, Apr.5th 2014. Just a day late from my 2 weeks prediction. A satisfying little project this one. 52.013 Currant Clearwing (female) one of five at Skircoat Green allotments, June 18th 07. Occurs annually here from 2007 onwards in very small numbers, in some years just one has been noted. We took on the plot in 2006 and I made sure there were a few currant bushes around in the hope of attracting this species and lo and behold two years later I was getting one or two on my own patch. 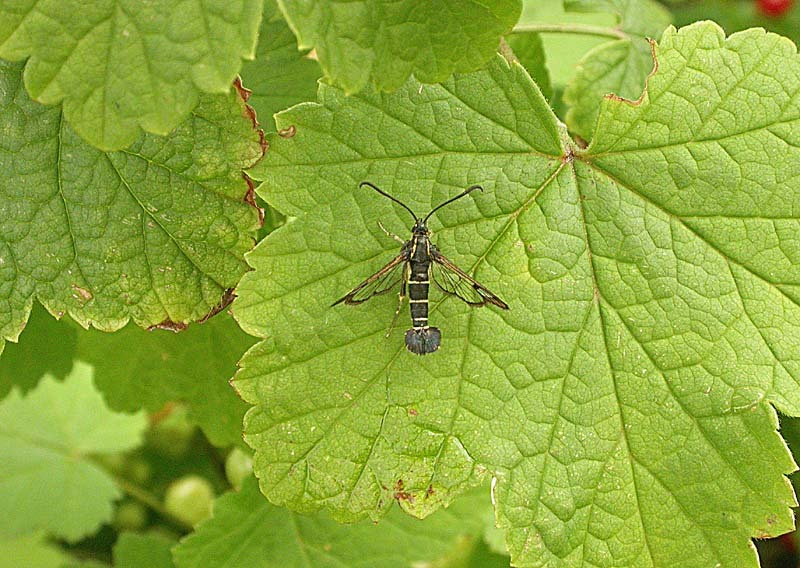 52.013 Currant Clearwing (male) on red currant at Skircoat Green allotments, June 18th 06. Although "honorary" macros this shot shows that they are still small moths. The males have four yellow bands on the abdomen and the females three. 48.001 Nettle-tap, Bankhouse wood, May 4th 2014. A field observation. 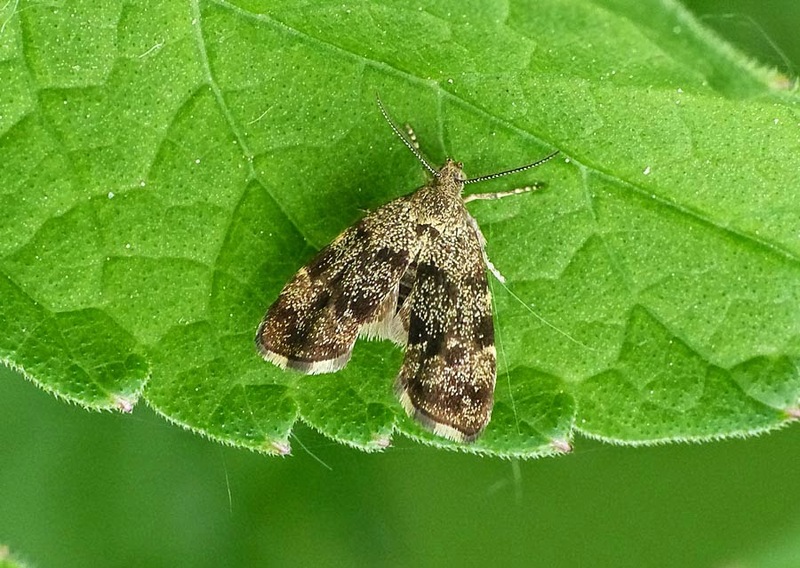 48.001 Nettle Tap, Bankhouse wood, May 26th 2014. 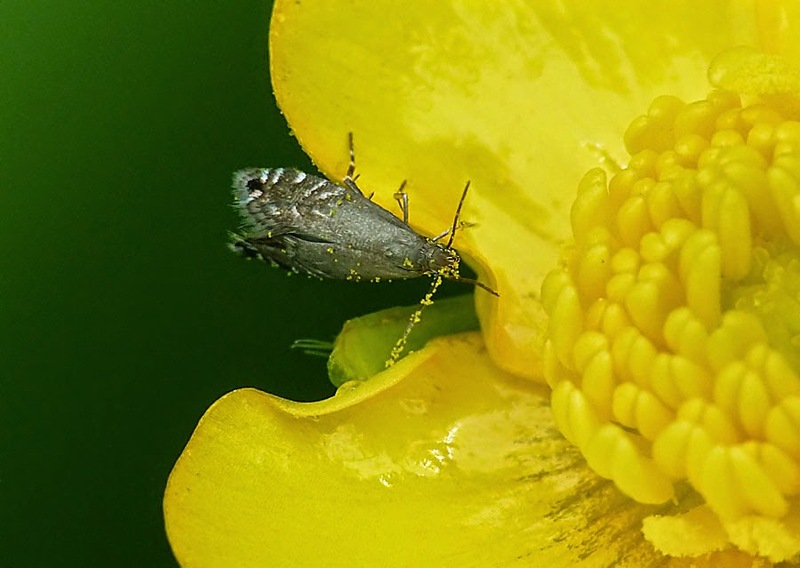 This one was nectaring on a buttercup and visually demonstrates how useful they are for pollinating plants. 19.007 Cocksfoot Moth (Glyphipterix simpliciella) North Dean meadow, May 26th 05. 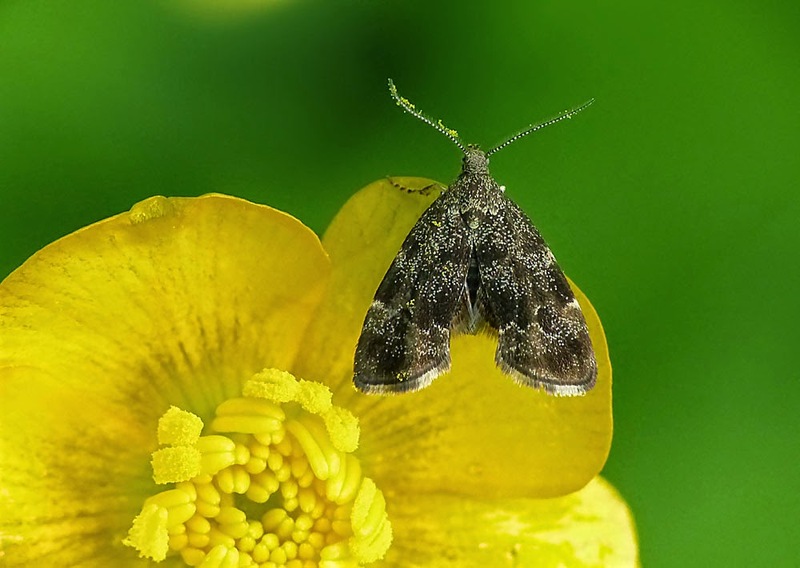 The buttercup is about an inch across giving a good idea of the size of these moths. They can sometimes be seen well in to double digits all nectaring on a single flower. 19.007 Cocksfoot Moth (Glyphipterix simpliciella), All Saints' graveyard, Skircoat Green, May 26th 2014. 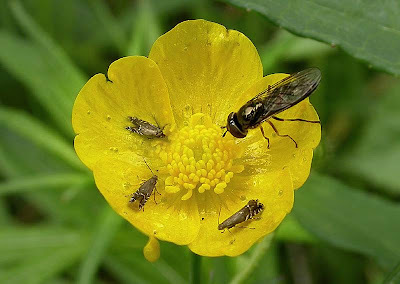 A field observation nectaring on a buttercup - habitually covered in pollen grains. 19.005 Cotton-grass Fanner (Glyphipterix haworthana), feeding signs on Common Cotton-grass at Erringden moor above Mytholmroyd, Dec.2nd 2013. As the grass seedheads would have naturally dispersed by now it seems likely that these seed heads have been spun together by the larvae of G. haworthana. 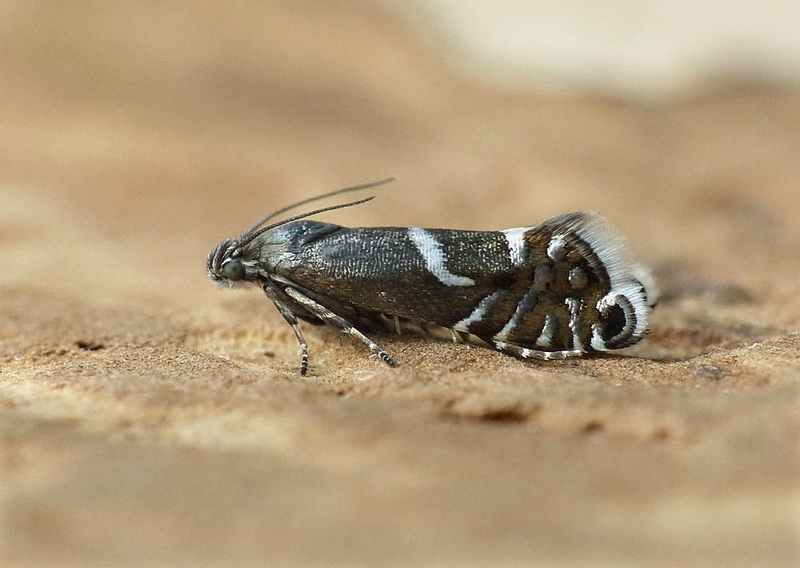 I shall tie them up in some old nylons and leave them outdoors over winter much as I would treat the Phyllonorycter group. Hopefully next April I shall see some adults for the first time. 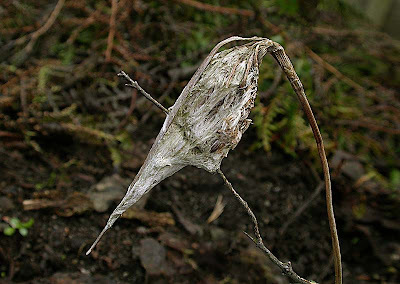 19.005 Cotton-grass Fanner (Glyphipterix haworthana), pupa, Apr.13th 2014. 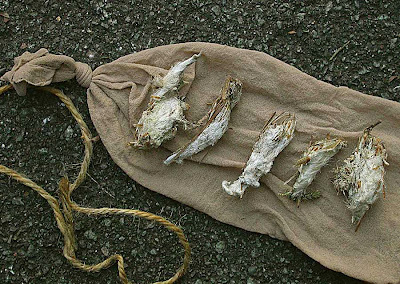 Of the eight seedheads collected and teased apart I found that four contained larval tubes, two of which were tenanted with larvae. 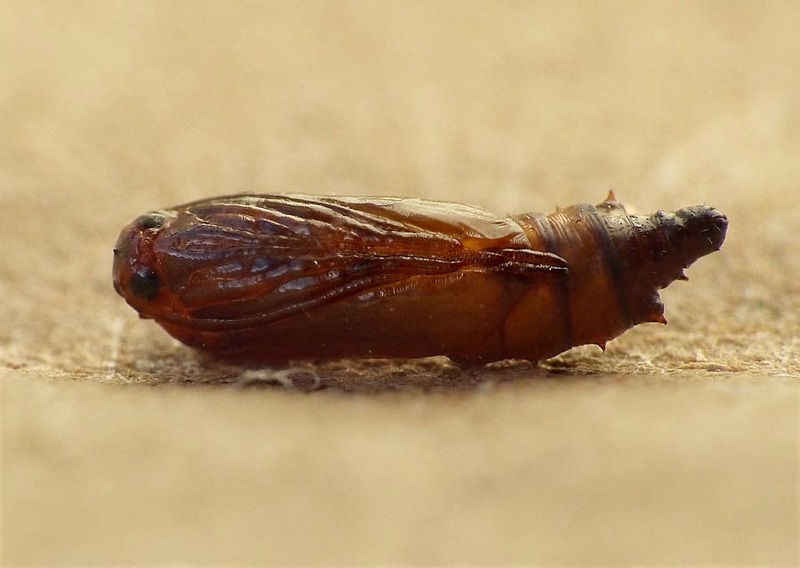 One however was parasitised and the wasp pupa was soon "discarded". 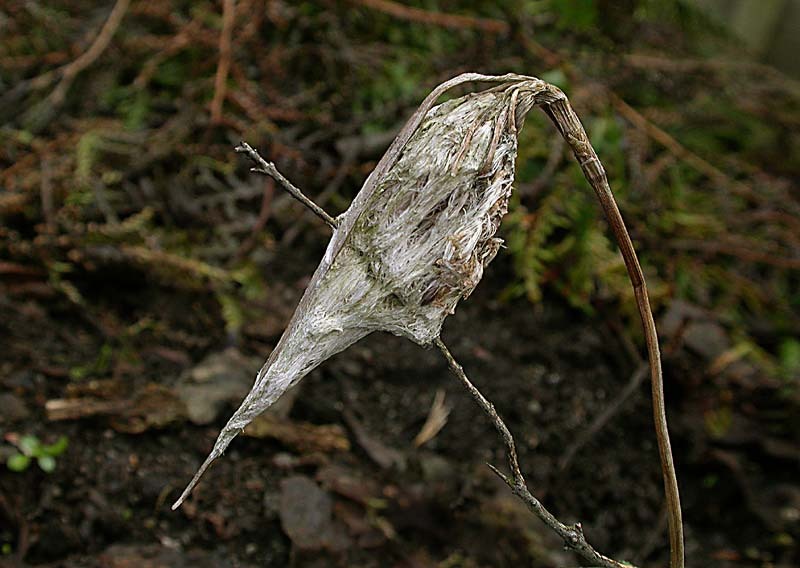 The other went on to produce this pupa with it's characteristic thorny, stunted rear end. 19.005 Cotton-grass Fanner (Glyphipterix haworthana), Apr.17th 2014. In the last three days the pupa coloured up very swiftly and produced this lovely adult. VERY frustrating to photograph as it was very flighty or when stationary would usually be pumping it's wings up and down as members of this family do when agitated. 19.005 Cotton-grass Fanner (Glyphipterix haworthana), feeding sign on Common Cotton-grass, Norland moor, Feb.10th 2011. 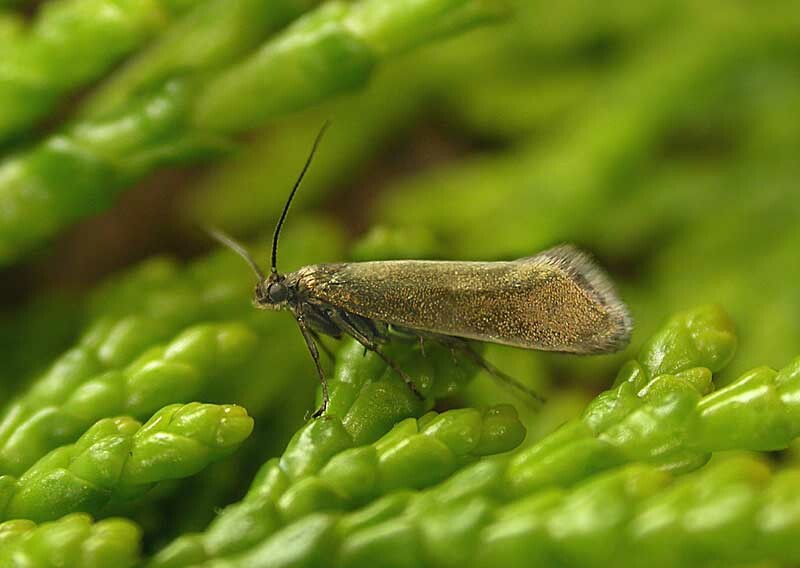 19.003 Plain Fanner (Glyphipterix fuscoviridella), one of a dozen or so flying by day at Mayroyd moor, Hebden Bridge, May 20th 08. Captured by day. This rush loving moth has also been recorded once at Norland moor in May 2010.